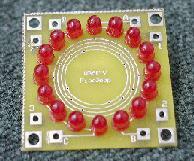 This is an economy pelorus display for the PicoDopp DF, with 16 LEDs arranged in a circle. Connects directly to outputs provided on the PicoDopp MAIN board. NOTE : This display cannot be simeltaneously used with the economy numeric display. This is an economy numeric display for the PicoDopp DF. It has a 3 digit numeric readout, and connects directly to outputs provided on the PicoDopp MAIN board. NOTE : This display cannot be simeltaneously used with the economy pelorus display. 7-12 VDC, 100 mA max. The PicoDopp MultiDisplay provides a combined numeric and pelorus display in a single board. 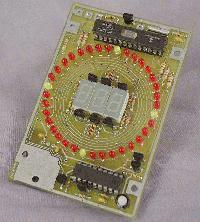 A high quality display, with 2 microcomputers and an RS232 input that accepts Agrello DF messages. The PicoDopp MiniAntenna is an integrated VHF Doppler antenna with an integral PCB ground plane. It measures 9.5 inches in diameter, with 4 BNC connectors for antenna elements plus one more for RF output. Stripline PCB techniques and SMT components make it suitable for use from 500 to 1000 Mhz, and beyond. Operation below 500 Mhz will suffer some loss of RF sensitivity, but it can otherwise be used down to 100 MHz. Intended for use with the PicoDopp DF, this antenna provides an alternative for users who may not wish to construct their own antenna platform. The NorthUp compass is an electronic compass that converts DF bearings from relative degrees to magnetic north degrees. It accepts an Agrello DF RS232 message, adds the compass reading to the DF bearing, and re-transmits the message through a second RS232 port. 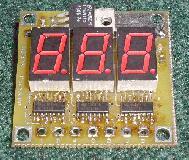 Intended for mobile operation, it provides an "azimuth stabilized" DF display. When employed, changes of vehicle heading do not affect the indicated DF bearing, and the 12 o'clock position of the display represents magnetic north, instead of the vehicle's present heading. Especially useful for the computer display programs, which integrate multiple DF readings. The stabilized display produced by the NorthUp compass allows the integration routines to operate at maximum efficiency without the need for constant ( manual ) updates of vehicle heading. NorthUp uses a DB15 connector, with spare pins for antenna control lines. An IrDA output for a stabilized ( cordless ) PDA display is also provided, and a very effective correction routine compensates for nearby metallic masses.